TakeTheGlobe.com has sent you money through AlertPay. It's not a small amount, isn't it? Yesterday I recieved my 2nd payment! Admin here, is a very serious man, who pays and follow the rules. 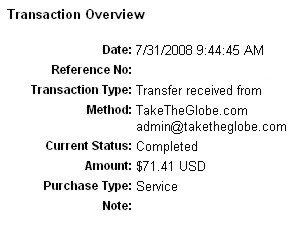 I just want to share with you that I have been paid by taketheglobe.com today as my 3nd payment with amount of $317.27. I am very happy to receive payment. TTG, you are rock. Thanks for all. I will see you there if there is any interested in. Wow, nice payment you have there. Congrats! still the best for me..
paid within 20 days premium. Thought i'll give it a try, lets hope he can keep on paying within reasonable dates for some time.